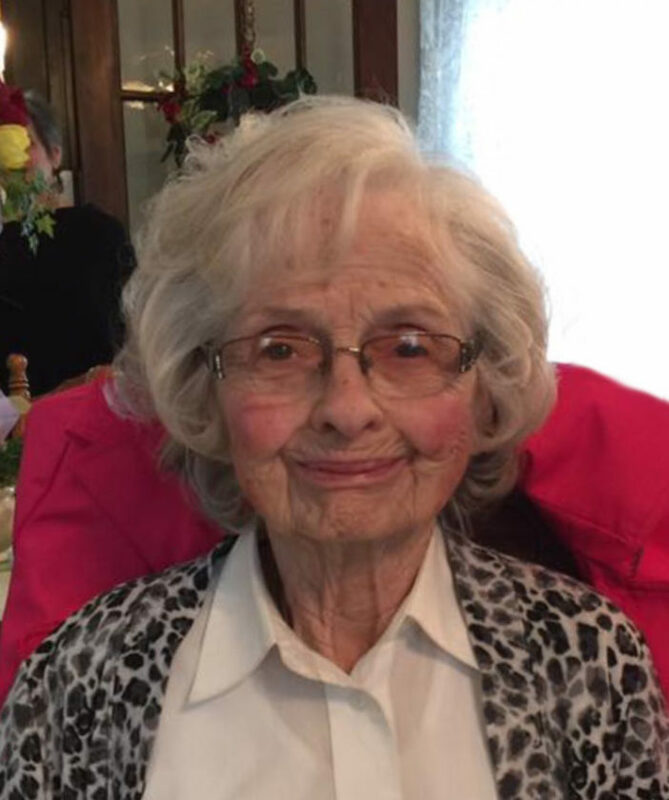 Carol Elaine (Fitz) Jontz, 98, passed away at Glenwood Assisted Living Home on January 8, 2019, with her daughters by her side. Visitation was held Thursday, January 10 at Mitchell Family Funeral Home from 6:00 p.m. to 8:00 p.m. A memorial service will be at 11:00 a.m. Friday, January 11 at the Laurel United Methodist Church with lunch immediately following. A private burial will take place later at Riverside Cemetery in Marshalltown. “I was born at the Fitz family farm in southeast Marshall County on October 23, 1920, the youngest of six children born to Emory and Jessie Pearl Talbot Fitz. I was a birthright member of the Laurel Methodist Church where I was baptized, confirmed and married. After graduating from Van Cleve High School in 1938, I attended Central Iowa Business College in Marshalltown. Then I worked for J.W. Pattee, followed by W.B. Wood at Gra-Iron Foundry. On March 7, 1943, I was united in marriage to my high school sweetheart, Cadet Edwin E. Jontz. We moved to Lemore, California where Eddie was taking basic training at the flying school. I worked as a secretary as well as a chauffeur for officers. Our first baby girl, Barbara Pearl was born in Douglas, Arizona. Upon Eddie’s discharge from the Army Air Force, we lived briefly in Ames, Iowa and then to Elkader, Iowa where Eddie was flight instructor for G.I. boys. Our second daughter, Janey Carol, was born there. When my dad passed away in 1949, we moved to the Fitz home place so that my mother could stay there and Eddie could farm. Our third daughter, Julie Ann was born there. When my dad died we moved around the corner to the Collins place and we later bought the Wehrman farm and moved just 2 miles away. Together we farmed and later established the E/J Farm Supply in Baxter, Iowa. We continued farming and operating the business for 20 years until our retirement. We lived briefly at the Embers and in a townhome in Marshalltown before I moved to Glenwood in 2015. Carol is survived by her 3 daughters: Barbara (Jerry) Gazaway, of Marshalltown, Janey Sherman, of Santa Fe, New Mexico and Julie (Steve) Lang, of Marshalltown. Grandchildren and great grandchildren are: Jeff (Lisa) Gazaway, of Urbandale, Tom (Melanie) Gazaway (Aiden, Zander and Micah), of Fayetteville, Arkansas, Matt (Tara) Gazaway (Eva and Isabel), of Lenexa, Kansas, Jerah McCargish (Maycee), of Santa Fe, New Mexico and Jakub Sherman, of Las Cruses, New Mexico, Josh (Cathy) Lang (Jillian, Brody and Howie), of Marshalltown, Joey (Wendy) Lang (Liz, Noah and Oliver), of Marshalltown, Brooke Lang, of Marshalltown, as well as many nieces and nephews. Carol was preceded in death by husband, Eddie (2004); parents Emory and Jessie Fitz; in-laws Elmer and Mary Jontz; all her siblings and spouses: Lucille (Harrison) Wunn, Eugene (Hazel) Fitz, Marcus (Edna) Fitz, Mabel (Morris) Brown and Violet (Donald) Tyrrell. In lieu of flowers, memorials may be directed to the family for either the Taylor #4 one-room school or the Laurel Methodist Church Memorial Fund.